Join the Centre-Val de Loire INSA! Our higher education engineering courses are taught over five years and students can join them at the start of any of those years. Play a part in the breakthroughs of tomorrow! Find out about INSA and the career opportunities available to you. 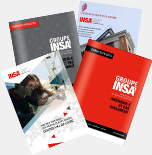 The INSA Partners’ Network is the ideal setting for strengthening professional skills. Get back in touch with us! We’d love to hear about your professional experiences: they help us to keep our current and future students better informed. All of the school’s news, press releases, publications and press packs.